fobo, the GIF photo booth, is a fun twist on the classic and perfect for social media. Change your pose through a series of 4 photos and instantly text out your animation! fobo’s easy-to-use touchscreen interface allows guests to select their filter (including our popular GLAM airbrushed look), print and text for fast and easy sharing. Add a live slideshow for a rotation of all your GIFs in real time—it’s sure to be the hit of your event! It didn't happen if it didn't happen online, right? Our fobo GIF photo booth delivers images instantly to phones, ready to be shared on any social network. We have been building and renting photo booths since 2003, and we know the best way to get images out is quickly and directly. We have sidestepped lengthy log in processes to deliver images ready for any social network instantly. Facebook, Instagram, Twitter, hashtags are all at your fingertips! Every GIF is printed in a 4-frame window format on a 4x6" print. fobo is so good that you will receive a mantle-worthy print in mere seconds! Basically, you get a print faster than you can text it! 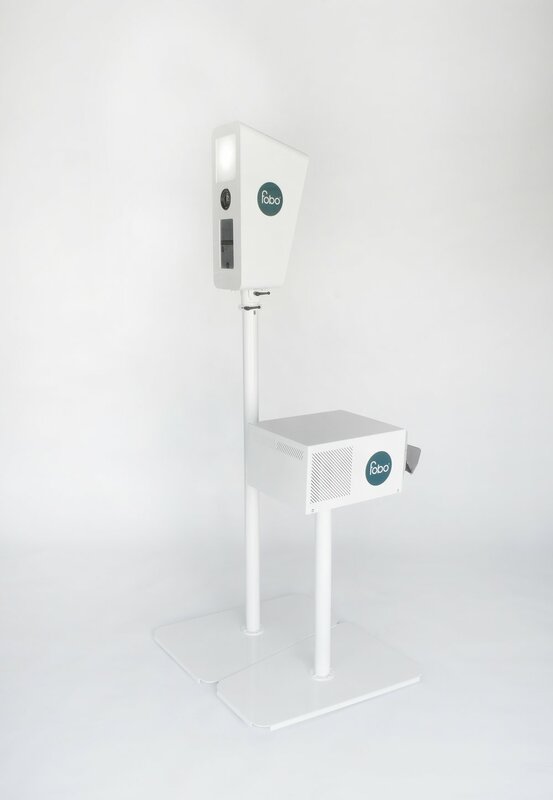 Modern, open-air design makes the fobo photo booth a great fit for any space. fobo is equipped with the best lighting and camera equipment to ensure stunning image quality for every shot. Our animated GIF booth captures your guests at their best, 4 frames at a time! You can include a graphic or logo on all of the prints and images shared online. Custom green screen backgrounds can give your event images a unique look. Work with our team of designers to come up with the perfect look to market your brand, celebrate your day, or commemorate your event!